High school is hard but in the era of evolving technology and the power of social media, it seems to get even harder. But what hasn't changed is the presence of the bully. The bully has now had the ability to turn into the cyber bully. This is the backdrop Adam Szymkowicz sets his play Rare Birds. Produced by The Red Fern Theatre Company, the troubled, offbeat kid is forced into a difficult decision after a video goes viral around the school and his bully literally puts a gun in his hands. Evan is a little bit different. He has a fascination with birds that no one seems to understand. He has a crush on someone who barely sees him. His dad left his mom and him alone. His mom is eager to find love again. And Evan challenges every single guy who walks through the door. Evan is trying to handle it all and his life just seems to be spiraling out of control. If Adam Szymkowicz's story sounds familiar it's because it, well, is. Stories like this have been nearly exploited in media. But that's not necessarily a bad thing. If it's done well. Rare Birds is one of those middle of the road shows. Szymkowicz doesn't offer a new perspective in the theme. For the most part, the plot is predictable. The characters fit into common stereotypes. 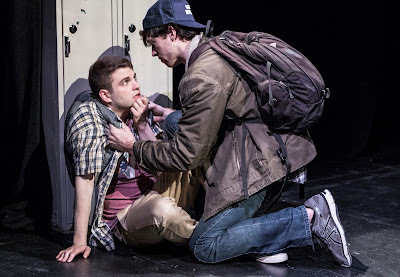 The play is essentially told through the perspective of the victim and, whether it was the text or characterization, or some combination of the two, Evan isn't a completely sympathetic character. Yes, you sympathize with the situation but Evan is a challenging person. He is a lost soul in a way that defies the help that's offered to him. We never see him ask for solace from the bullies. Could it have backfired? Yes. But in a story, that complication is necessary for Evan's journey. Even when there is a moment to tell his mother about his problems, she is completely oblivious, not even noticing her own son bloodied after a beating by the bullies. Is this because she may have a drinking problem? It's possible but it's never addressed. And when it comes to layering Dylan the bully, he's presented as a one-dimensional antagonist whose only nuance is potentially being a homophobic closet case. Again, nothing novel. Cyber bullying is a current topic but Rare Birds feels falsely dated. We see hints of humor in Szymkowicz's text but the audience never seemed to be invited to laugh. Director Scott Eberold needed to somehow infuse more humor at the start to avoid the weighty topic becoming too overwhelming. There were hits of comedy in Szymkowicz’s writing, especially when combined with the hutzpah of Evan, but the audience didn’t seem to get an invitation to laugh. There was an aura of classic sensibility in the story, reminiscent of a Greek tragedy where everything is heightened. Scott Ebersold attempted to bring the high stakes nature of the world into today. When it came to bringing this world to life, Scott Ebersold managed to retain reality despite. The vastness of the 14th Street Y Theater wasn’t a challenge for scenic designer Andrew Mannion. The focal point of Mannion’s design was Evan’s bedroom featuring birds a-plenty. The way Mannion created Evan’s world allowed more insight into Evan but when it comes to being nitpicky, the placement of the door handle was a bit of a hindrance when it came to actors unable to find it in the heat of the moment. With the play being a multi-location piece, Mannion used the extremes of the stage for a set of lockers and a dining set on either side. Thankfully they didn’t pull focus as much as the painted backdrop that housed the lagged videos. Izzy Fields’ curating of the costumes was interesting. She was pigeonholed, pun intended, when it came to Evan’s attire, but once again, a narrative was provided in the looks for the bully and his sidekick Dylan and Mike. They somehow managed to read as bad 80s bully. This was Evan’s story. And boy did he have a journey. Trying to find a way to portray the victim in a new light is difficult. Jake Glassman was heavy in the hysterics as Evan in hopes of finding the funny. It read as something different thanks to the text. Glassman is a charismatic performer, it just didn’t connect to this particular journey. As his mother, Tracey Gilbert made Janet the “over-it” mother who comes to the rescue a little too late. Difficult characters was the trend in Rare Birds. Dylan’s plot twist was clear from the start simply due to being a step ahead. George Colligan tried not to play into that hand. Rare Birds is a play that thrives on the emotional content. It unfortunately begged too hard for it. With Chekhov’s gun on the mind, it was just a waiting game to see how it was going to be executed.